Ingredients with integrity: Many pet food makers use stuff we never use from places we don't trust. The Honest Kitchen is made in the USA and never contains unsafe and unhealthy ingredients found in feed-grade products. This means no byproducts, fillers, additives, preservatives or GMO ingredients. Sources we trust: To meet our 100% human-grade standard, our suppliers must certify they meet the strictest standards for food safety as well as sustainability and fair-trade practices. We only source from folks we know and trust, including a few we started with back in 2002. Kitchens, not compromises: Our company started in our founder's kitchen, where she made meals for her family. Today, we're still preparing our food alongside breakfast cereals and bakery mixes, following the same rigorous safety, cleanliness and quality standards of people food. no by-products, preservatives or GMO ingredients - just add water for a warm and delicious meal. 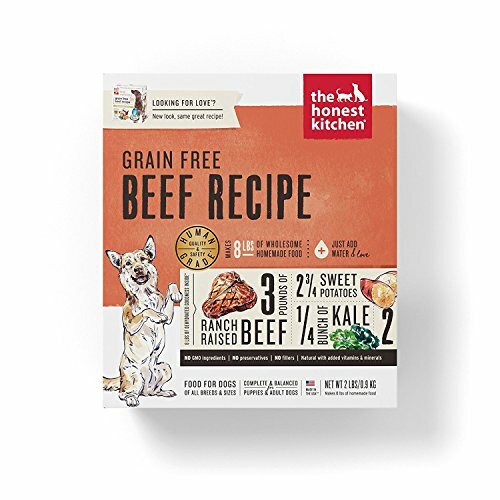 If you have any questions about this product by Honest Kitchen, contact us by completing and submitting the form below. If you are looking for a specif part number, please include it with your message.